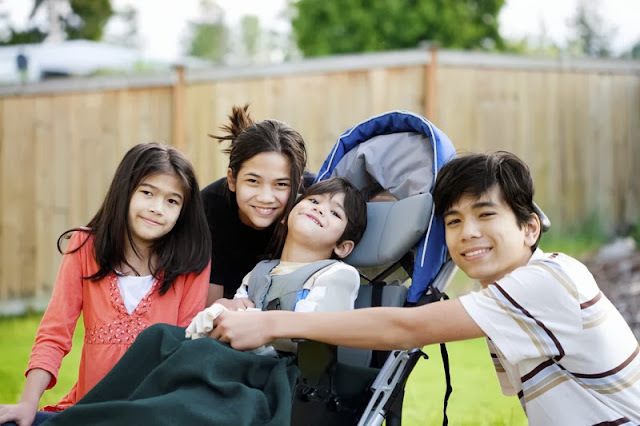 A recent Pediatrics study found siblings of children with disabilities were almost three times more likely to have parent-reported emotional and behavioural problems than siblings of typically developing children. The study at the University of Arkansas for Medical Sciences (UAMS) drew on data from a national, large-scale American survey. Researchers identified two groups of siblings aged five to 17 years: one had 245 siblings who lived with a child with a disability and the other had 6,564 siblings who lived with children without disabilities. Parents answered questions about siblings on the Columbia Impairment Scale, which looks at a child’s function in 13 areas, including relationships with family and friends; emotional health; school work: and use of leisure time. The surveys were done twice to look at changes over a 12-month period. I interviewed Dr. Anthony Goudie, assistant professor in the Department of Pediatrics at UAMS and principal investigator. BLOOM: How did you get interested in studying siblings? Anthony Goudie: I came from Cincinnati Children’s Hospital and we worked on a grant from the Ohio Developmental Disabilities Council that looked at the effects of families caring for children with disabilities. Part of the first round was doing some focus groups of parents of kids with disabilities. We wanted to understand their daily lives, the services they obtained and the ones they lacked. Through the focus groups we identified a group we weren’t focusing a lot of attention on and those were the other children in the family. There were some very poignant and emotional stories about how siblings were reticent to ask their friends to come over to play because the child with a disability might be disruptive, or their friends weren’t familiar with severe mental disabilities. There was a certain amount of embarrassment that the child was going to act up and while the sibling understood, his friends wouldn’t. BLOOM: Your study found siblings of kids with disabilities to be almost three times as likely to have significant functional impairment. What does significant functional impairment look like? Anthony Goudie: These are kids who have problems getting along with other members of the family, problems making and keeping friends, and behaviour issues. They tend to have a lot of anxiety and emotional problems, in terms of feeling unhappy, afraid or nervous of certain situations. They don’t tend to be able to feel that they can express their anxieties of fears, so they internalize them. They also have problems focusing attention at school. BLOOM: How could these problems affect a child in the future? Anthony Goudie: A clinical association has been made between functional impairment and higher rates of depression and mental illness. BLOOM: How did your study work? Anthony Goudie: We used data from the Medical Expenditure Panel Survey, which is essentially five interviews equally spaced over a two-year period. In two of those interviews, spaced about 12 months apart, parents answered questions on the Columbia Impairment Scale. First we wanted to see if there was a difference between the group of children with siblings with disabilities and the group of children with typical siblings. Overall, we found kids who live with children with disabilities have significantly higher functional impairment than kids who live with children who are typically-developing. They’re almost three times as likely to have these problems. If you’re a primary-care physician you need to know that growing up with a child with a disability is a risk factor for mental-health issues. If you’re seeing a child with a disability you need to ask how the other children in the family are doing. Mental-health screening and counselling and sibling support groups have been shown to be helpful. Our paper was geared to the health system. We want the health system, insurance providers and policy makers to develop family-based solutions that consider all members of the family. BLOOM: What changes did you see between the two groups over time? Anthony Goudie: The group who live with siblings with disabilities and the group who live with typical siblings both increase in functional impairment scores on average. The scores of kids who were significantly functionally impaired at first measure who live with a sibling with disability do come down at the second measure. But not nearly as much as kids who scored with functional impairment at first measure who have typical siblings. BLOOM: How do you explain the difference? Anthony Goudie: I attribute the difference to potential counselling. If you’re a parent of children without disability and you notice one child starting to act out at school or having social interaction problems, you might be more proactive in getting that child some counselling, or identifying the problems on a well visit to your doctor. But if you have a child with a disability, you might not have time to actively seek some help for the sibling because your time is focused on the child with disability. And the problems of the other child might pale in comparison to those of your child with disability. There’s also a socioeconomic aspect. The families of children with disabilities in our study were poorer. And that’s not because poor families have higher rates of children with disabilities. That’s because parents have to leave the workforce to care for their child. So the families of the children without disabilities may have the insurance status and socioeconomic means to go out and get counselling or proper primary health care for their kids while the other group of families doesn’t. BLOOM: You suggest that increased functional impairment in siblings of kids with disabilities is because parents have less time and attention to spend on their typical kids. Anthony Goudie: Yes, we make that association and it’s based on what is in the literature and backed up by what parents tell us anecdotally. They do have less time and they get less sleep and it ends up meaning less time to spend with the typically developing children. These caregivers are certainly not neglecting their other kids. They’re just as concerned about all of their kids. It’s the reality of the extra demands they face. BLOOM: Do these findings apply to families of kids with all kinds of disabilities? Anthony Goudie: A child was defined as having a disability in our group if parents responded ‘yes’ to a question about the child’s functional limitation based on a medical condition. The survey doesn’t ask what the condition is. However, data from the 2005-2006 National Survey of Children with Special Needs asks questions about a child’s functional limitation and their specific condition. In this survey, most of the children identified with functional limitation were complex kids. Forty per cent had difficulty breathing. One-third had [intellectual disability] and 28 per cent had problems swallowing and digesting food. These kids have multiple issues. I think kids with less significant disabilities take a lot less time and effort to parent. 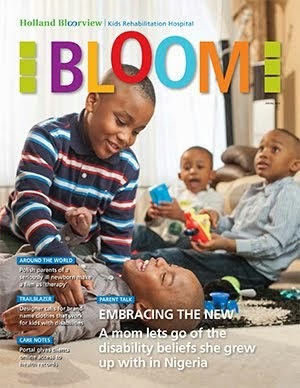 BLOOM: What message should parents of kids with disabilities take from this study? Anthony Goudie: I think they need to be a little more proactive in looking at the triggers of functional impairment. All kids have behaviour problems, but if your child has behaviour problems and they’re feeling unhappy and sad and having trouble with school work, I’d recommend you seek some counselling or a medical opinion. BLOOM: I think this study creates pressure on parents who already feel that they’re not doing enough for their child with disability. Now they have to worry that they’re not doing enough for their other kids. And how easy is it to get mental-health services for a child with a therapist who understands the unique experiences of these families? Anthony Goudie: I think in the U.S. it’s extremely difficult to find that kind of help. Just getting primary health care is an issue for a lot of families so specialized mental-health care is even a greater issue. There are some good sibling support programs. Seattle Children’s Hospital has a really good one. We’re in the conceptual stages of trying to get one off the ground here. And we need interventions that don’t exclude families who are poor. BLOOM: There are other studies that have shown positive outcomes of growing up with a brother or sister with a disability. What do you make of those? Anthony Goudie: There are exceptional families and parents who are resilient and take a positive outlook that this is going to bond them even more and put a lot more context into their household. But I’m not sure that the other studies included families who are socioeconomically challenged. I’m not sure that they had the right demographic. People with economic means are going to have ways to overcome some of the challenges and get the right amount of counselling and support. Most of the other studies I’ve seen have 20 to 30 siblings. Our study with 245 siblings of children with disabilities is the largest I’ve come across. Editor's note: There are excellent resources at the Sibling Support Project. Holland Bloorview hosts a sibling panel each year where brothers and sisters talk about their experiences growing up with a sibling with disability. Other resources can be found in our Family Resource Centre and by calling our Warmline at 416-424-3888 or toll-free at 1-877-463- 0365. Hear about a children's book written by a family about siblings: Melanie And Tommy Have Two Pet Rats and One Syndrome. Does the article differentiate between different kinds of disabilities? Are there age-order effects (i.e. are the effects different based on whether the disabled child is older or younger than his/her siblings)? Hi DandG -- No, the survey data they drew from had not asked parents to specify the type of disability or condition. They were only asked whether they had a child with limitations related to a medical condition. However, in looking at the National Survey of Children with Special Health Care Needs, which asks the question about functional limitations AND the specific condition, they found this group typically had more complex, multiple needs, including medical issues like breathing and swallowing problems. However, the group studied could have included children with milder disabilities, like an isolated physical disability. In the two groups studied, siblings of children with disability were more likely to be the oldest child compared with siblings of typical children, and less likely to live in middle to high-income homes. But I don't see anything specific to likelihood of problems based on whether the sibling is older or younger. Thanks! It is not just the mental health system that has to change, but the education system. Children who have experienced both Trauma or trauma, are referred to mental health because of their behavior in school. Treatment is to meet the educators' needs, not the child or the family. Many hands get tied that way. If medication is postponed with therapy only, and the behavior doesn't improve quickly enough, the child is at risk of placement anyway.......Our major public institution where children spend most of their days, is not equipped to respond to symptoms that manifest as behaviors. Everything is labeled defiance and treated with punishment. It is a tragedy of epic proportion.